No idea what happened to her after the incident but it is sad that this was attributed to yet another land dispute. Sabah land and survey department is notoriously known for poor handling of land applications. There're just too many pending cases. A case in point, my late father had an application for a piece of land when I was still a small boy. I have kids now and the application is still waiting for approval. 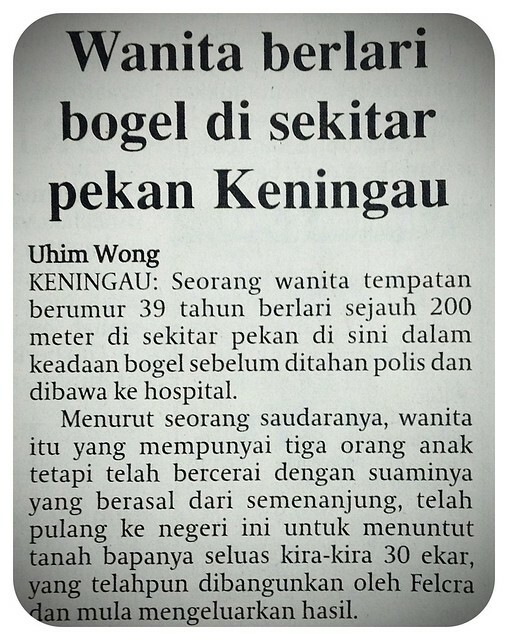 Last week a 39-year-old local woman ran around the old township in Keningau naked for 200 metres before she was stopped by police and taken to hospital. According to a relative, the woman who has three children but divorced from her West Malaysia husband had returned to the State to claim her father's land of about 30 acres, which had been developed by Felcra and had started yielding fruits. It was learnt that certain irresponsible quarters had reaped the land's yield of about RM33,000. The woman had filed a complaint at the Nabawan district office and also obtained the service of a lawyer to help her case but until now to no avail. On Monday at about 9.00am, the woman took off her clothes near Keningau Mall and ran around the old township before returning to the Kedai Telekom. She was arrested by police and sent to the hospital for treatment. I can imagine her frustration. Poor lady. I really hope she did not do it in vain.